The following is adapted from a press release from Realogics Sotheby’s about the status of The Sanctuary development at the former First Church building. Resource Transition Consultants (“RTC”), the court-appointed receiver for the lender of The Sanctuary, has announced the appointment of a design and construction team – led by Seattle-based general contractor Belfor Property Restoration – to complete the 12-home development by December, 2011. The project is expected to reenter the marketplace for sale in January, 2012. 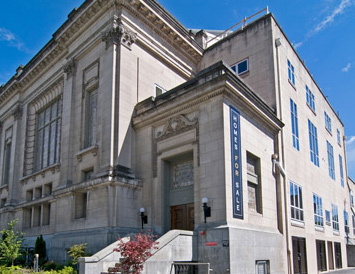 “We’ve assembled a world-class development team to complete the vision of The Sanctuary – a century-old church in Seattle’s Capitol Hill neighborhood that was converted into a premier multifamily community – and we look forward to successfully reintroducing the project for sale in the New Year,” said Rob Nall, Principal of RTC. According to Marty Goodman, principal of The Justen Company, the project scope now includes new clear and operable window systems to complement the historic stained glass in several units; elevator options; acoustical attenuation; refurbishing the central atrium; and restoration work on the historic exterior. In addition to warranties offered by manufacturers of installed systems and appliances, homeowners will benefit from a third party home warranty program that will be included with each sale. “We’re fortunate that RTC and Pathfinder are investing substantial resources to reach the full potential of this extraordinary development,” said Goodman. Belfor Property Restoration, a division of Belfor Construction, is tasked with completing the construction of the 12 concrete and steel townhomes and restoring the historic façade of the original building. One of the most striking attributes of The Sanctuary is the central atrium, an expansive interior common area with 38-foot-high ceilings and a breathtaking stained-glass dome. Seattle-based Robin Chell Design is converting the atrium into a residential amenity that draws on the building’s history and architecture and provides a central hub for residents and guests alike. Although the official listings for sale are still several months away, Nall says two unit reservations have already been accepted with more expected in the coming weeks. Unit reservations provide prospective homebuyers with a first right of opportunity to purchase a particular home when it’s offered for sale. “Every home is distinctive with unique floor plans and features so brokers and homebuyers are vying for the best possible selection,” said Nall. Disclosure: The Sanctuary is an advertiser of Seattle Condos And Lofts.